When someone you love has a Cancer Diagnosis it can be an overwhelming experience. This meeting is an opportunity to come together with others in a similar situation and be supported. The group will be facilitated by an experienced Cancer Support Nurse. Places will be limited. If you would like to attend please ring our Centre 0404 32696 to register. Tea/Coffee will be available and there is no charge. Vhi Annual Women's Mini Marathon 2018. This event takes place on 3rd June, 2018 around the streets of Dublin. Registration for this event takes place from the 7th March - you have to register to take part and receive your medal. This year you can either call in to our centre and receive a sponsorship card and t-shirt - or - join the East Coast Coffee Morning team who are taking part in conjunction with the coffee morning funds. Either ways your donations will come to us. More information can be had by calling the office on 0404-32696 during office hours. This event was the idea of Claire Darmody who was producer of the morning show on East Coast FM some ten years ago. 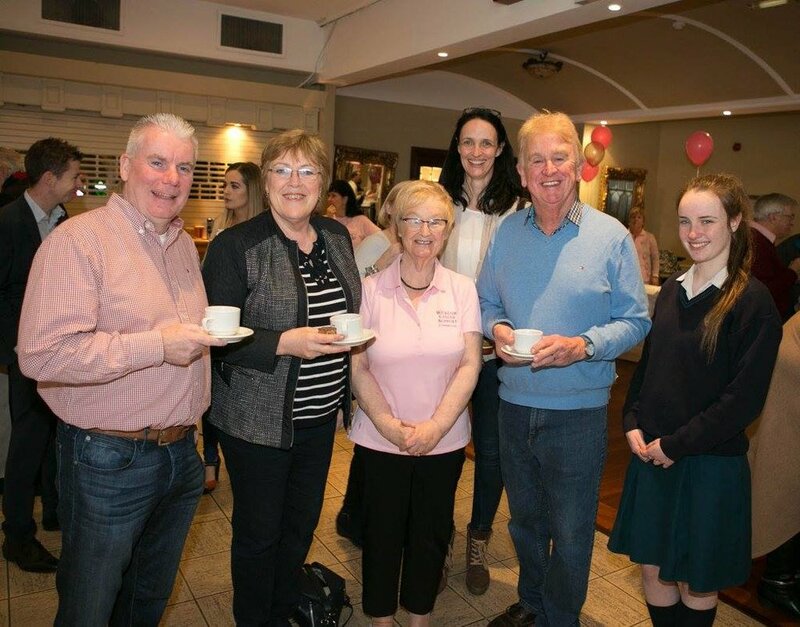 Her aim was to raise funds for the five cancer support centres in County Wicklow and the Wicklow Hospice. Each cancer centre runs their coffee morning on the same day along with various smaller events all around the county. This has become a very popular community based event and once again this year we are holding ours in the newly refurbished Grand Hotel, Wicklow Town from 10.00 a.m. to 1.00 p.m. on Friday 20th April. Year after year we get fantastic support from the local community and we hope to meet our many friends and supporters again and give them an enjoyable morning of food and entertainment. Anyone who would like to donate homemade cakes for this event can contact Eileen on 0868216694. Our usual bumper raffle will also be held that morning and our super MC. Robert Doyle is already preparing to make sure an enjoyable morning is guaranteed. The Annual Soccer Blitz held every Easter was the brainchild of Edele & Tony Doran. The first was held in 2013. Having had the experience of cancer in their family they felt they wanted to help in some way towards the running of our Centre. This has now become an annual event which is looked forward to not only by the Organisers but by all the children, adults & clubs who take part. To say it has gone from strength to strength over the years is an understatement. Despite the fact that unfortunately Edele passed away three years ago - Tony (Butch) and his loyal team of helpers have kept this going in memory of Edele, who worked tirelessly every year to make the event such a success. To date the amazing sum of €31,500 has been raised for us. This fundraising event is supported every year by various Businesses and Individuals and their support is very much appreciated. The matches take place in Finlay Park and Whitegates and we hope it will be another fun day to be enjoyed by all.